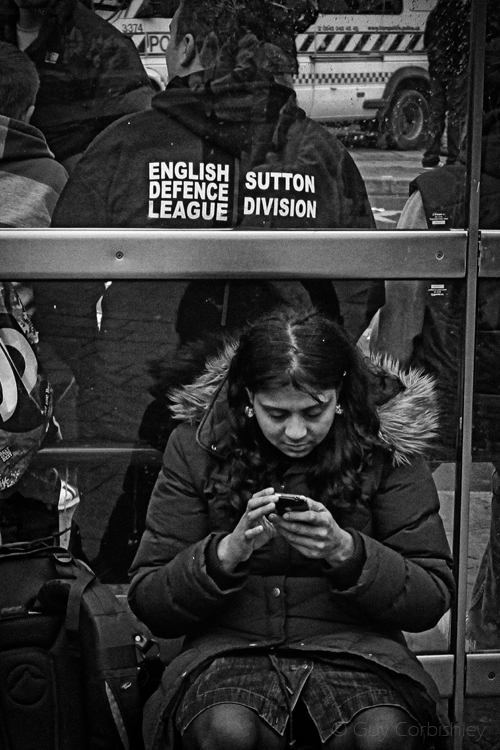 In the third of our features on photographers who have contributed to our 100 Images of Migration exhibition, we feature the work of Guy Corbishley, who submitted the photos of ‘Speaker’s Corner’ and ‘EDL protest’, two images that form part of what Guy calls his ‘continuing work exploring protest, politics, diverse cultures, human rights and the modern-day migration experience in Britain’. 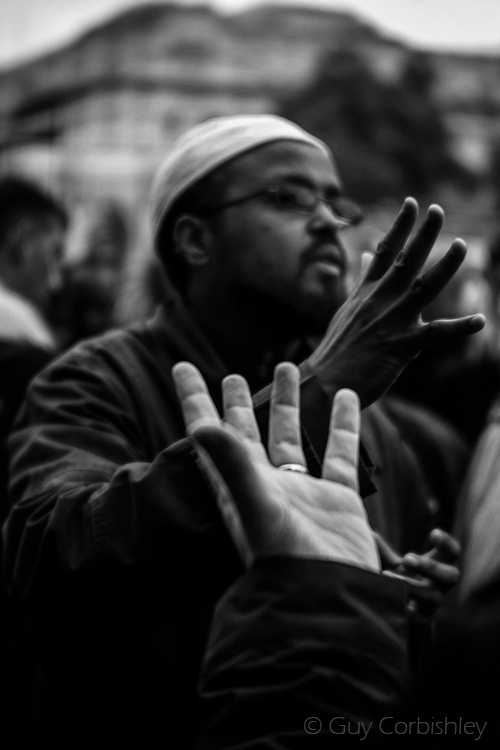 Both photographs are regular favourites with visitors to the exhibition, many of whom appreciate the ability of ‘EDL Protest’ in particular to draw three elements of this experience – the police presence, the EDL protesters and the young British Asian woman – in a composition that hovers uncertainly between dark and light. The same charge pulses through the photos Guy has selected for this blog, all of them stunning compositions which are never quite as straightforward as they first look. Needless to say, we are thrilled to be able to feature Guy’s photographs and deeply grateful to him for his involvement in our project. Guy has provided a brief note on himself and captions to the photographs that follow. I’m a full-time freelance photojournalist and documentary photographer. Currently I divide my time between working in London and abroad, supplying editorial, commercial and cultural imagery to a wide range of clients and publications in this country and across the world. One of my long-term personal projects involves documenting the last remaining Orthodox Pilgrims of Grabarka in east Poland and covering the geo-political conflicts of Ukraine/Euromaidan. You can e-mail me for more details: my address is at the end of this blog. 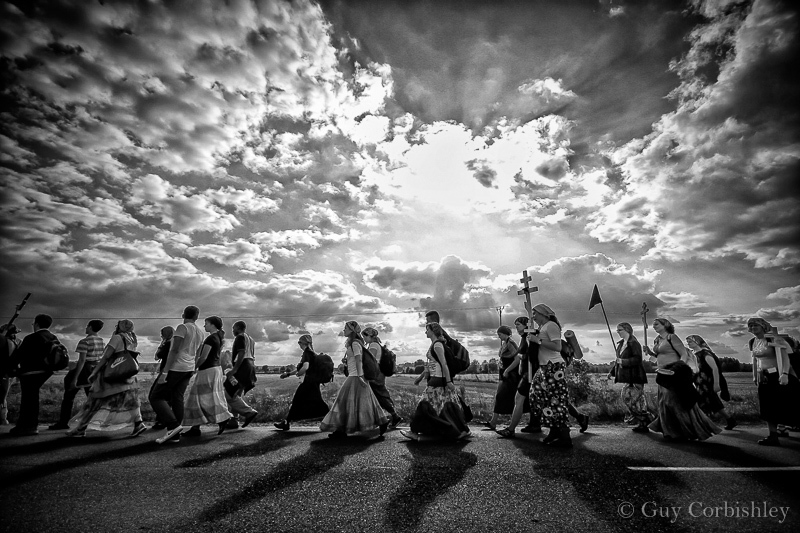 Every year thousands of Orthodox Christian pilgrims arrive at the holy mount of Grabarka in east Poland, some journeying many hundreds of kilometres by foot. The pilgrims gather at Grabarka Hill to celebrate the Feast of the Transfiguration in August. The hill and church are the holiest location for Poland’s few remaining Orthodox Christians. 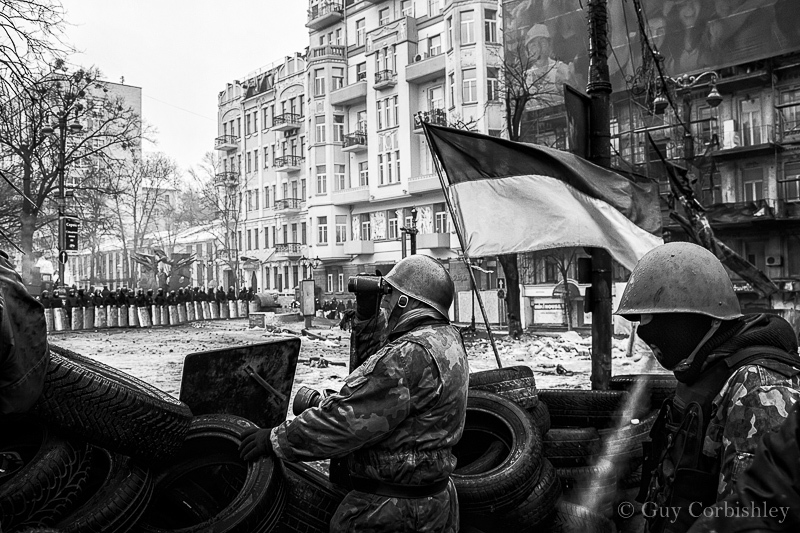 The Euromaidan is the name given to a wave of demonstrations and protests in Ukraine. These began on the night of 21 November 2013, when a large number of public protests demanded closer integration with Europe. The protests evolved into deadly riots that claimed more than 100 lives and led to the removal of President Yanukovych and his government. British-based Ukrainians march and rally for peace in central London on National Vyshyvanka Day. 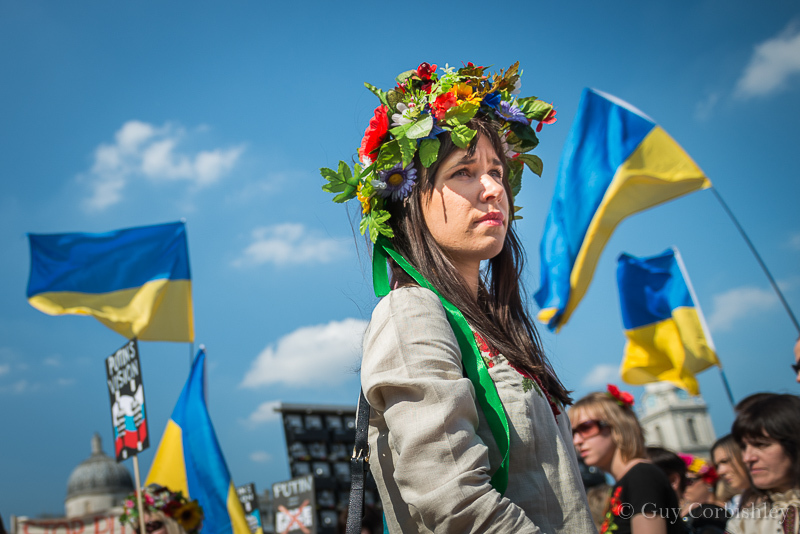 Dressed in Vyshyvanka – the traditional Ukrainian ethnic embroidered dress, which includes floral head wreaths – the marchers demonstrate adherence to the idea of national identity, unity and patriotism. 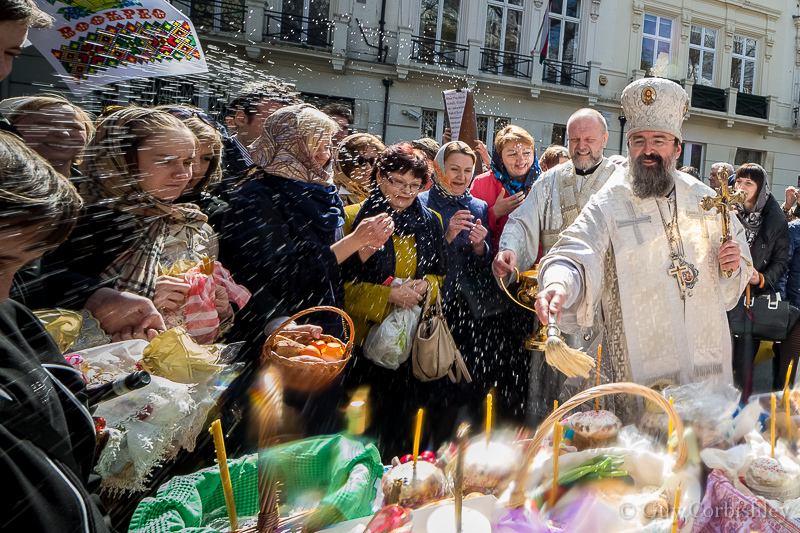 British-based Eastern Orthodox Christians, predominantly of Russian origin, gather outside the Russian church (Diocese of Sourozh) in Knightsbridge, London, where Bishop Elisey gives his Easter blessings to their Pascha (Easter) baskets containing decorated eggs and cakes. Campaigners, families of detainees and former detainees demonstrate outside Harmondsworth Immigration Removal Centre, Middlesex. Their protest is against the process increasingly used to fast-track the deportation of asylum seekers from the UK. 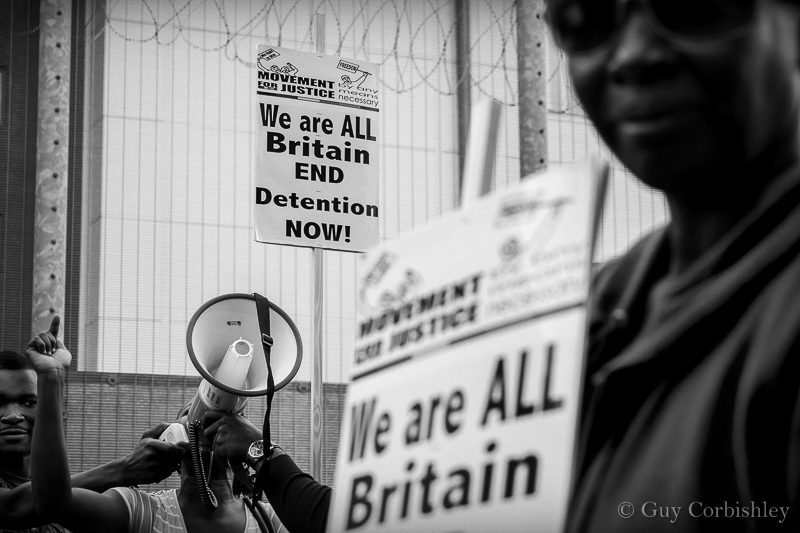 The civil rights activist group Movement for Justice and its supporters are campaigning for the closure of the detention centre and the launch of a full public inquiry into the alleged physical, sexual and mental abuse of detainees, which many of their complaint reports have documented. 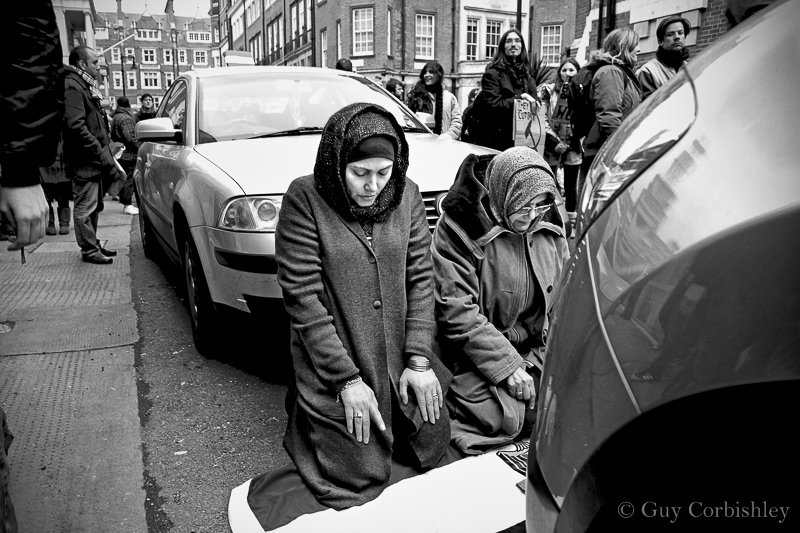 Two Muslim women take a break and prepare for noon prayers during protests outside the Egyptian Embassy in London. The protests were part of the demonstrations across the world, known as the Arab Spring uprising. 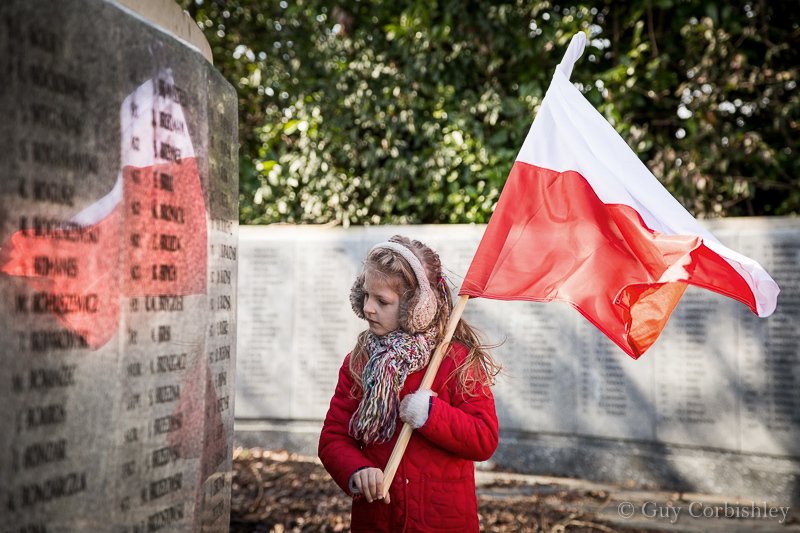 6-year-old Inka reads names from the Polish war memorial in South Ruislip, London. Every year British-based Poles march and hold service at the war memorial in commemoration of the ‘Cursed Soldiers’. The Cursed Soldiers (or Doomed Soldiers) were a partisan group battling for independence in the later stages of the Second World War and afterwards against the communists. Inka was named after Danuta ‘Inka’ Siedzikowna, 1928–47, a medical orderly in the 4th Squadron of the Polish Home Army. 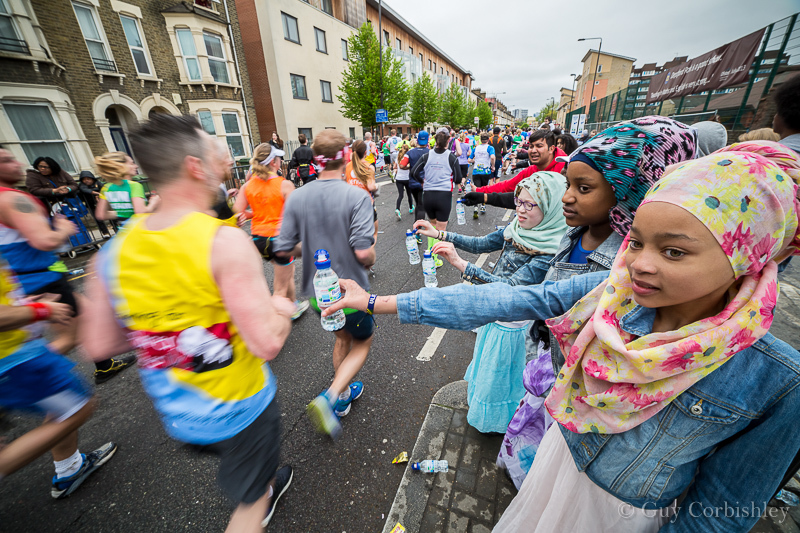 Local Muslim girls help out during the 35th London Marathon as it passes down Deptford’s Evelyn Street, south-east London. 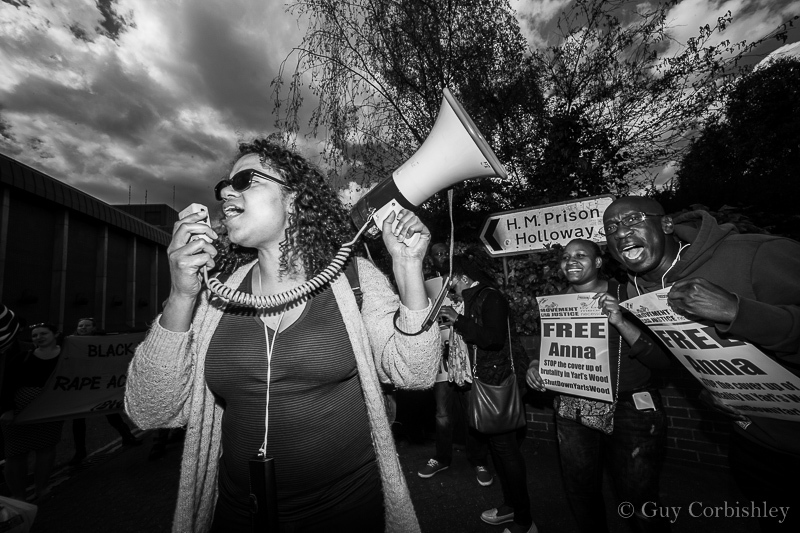 Antonia Bright, from the civil rights activist group Movement for Justice, leads a protest outside Holloway prison in north London. Protesters were calling for the release of a female inmate who had been imprisoned after being beaten by a prison guard (since suspended) while she was protesting at Yarl’s Wood Immigration Removal Centre against the deportation of a fellow detainee. 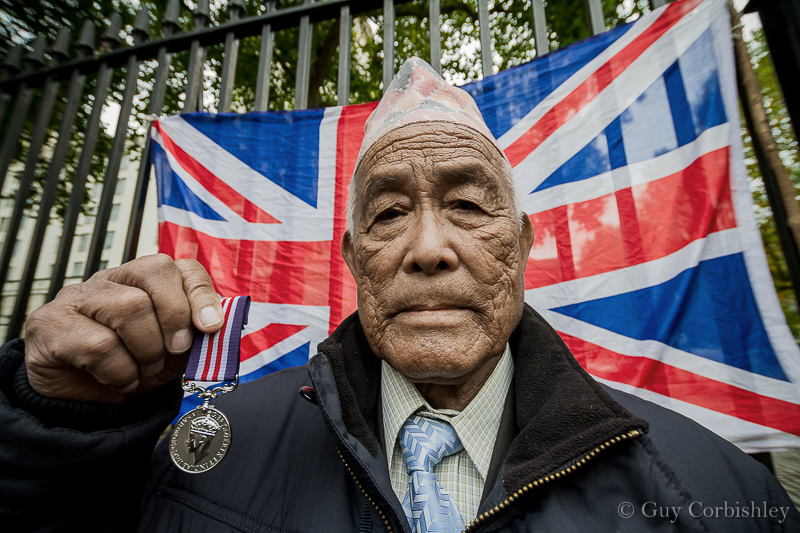 Veteran Gurkha Corporal Dilbahadur Thapa, 83, who served in the 10th Gurkha Rifles Regiment from 1948 to 1961, is reunited with a replica of his original war medal on the seventh day of a hunger strike opposite Downing Street in London. The hunger strike was carried out by two groups of Gurkhas – Gurkha Satyagraha and the BWHR British Gurkha Project –before being temporarily suspended by Lord Ahmed, who agreed to intervene and take up matters with Whitehall and Philip Hammond MP, Secretary of State for Defence. BWHR British Gurkha Project is calling for Gurkhas to be awarded British citizenship rather than settlement rights, which would entitle them to service pensions and to have their children come to live with them from Nepal. Currently pension rights for ex-Gurkha soldiers differ from those of the British soldiers with whom they served. Some Gurkha veterans receive no pension. 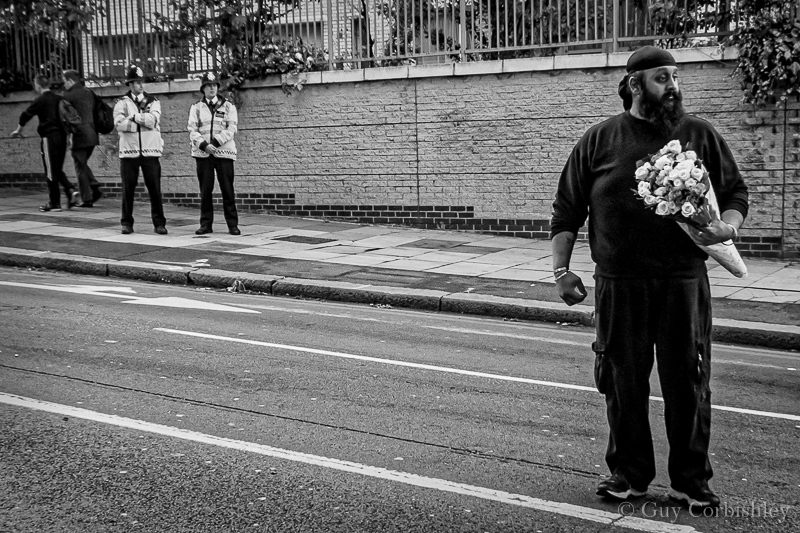 A local Sikh man crosses the road to place flowers on Wellington Street in south-east London the day after Royal Fusilier solider Lee Rigby was murdered by Islamic extremists. 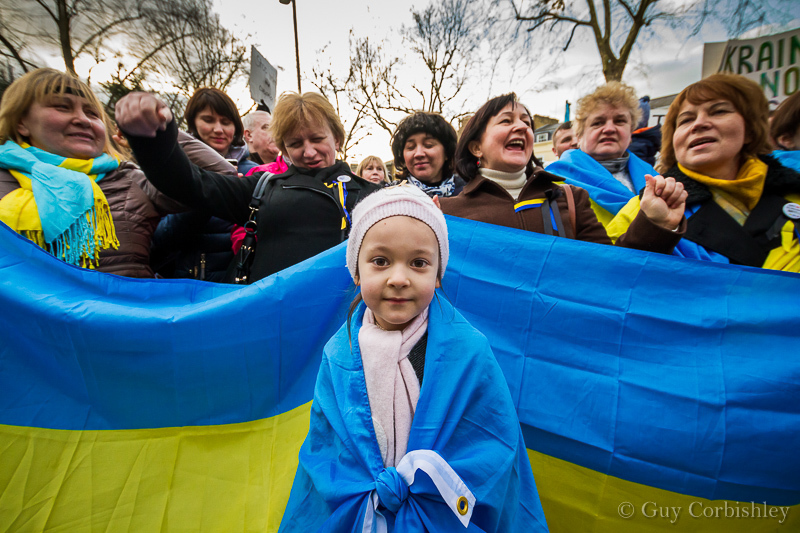 British-based Ukrainians staged continuous solidarity protests throughout London as part of the 2014 Euromaidan demonstrations. Opposite the Russian Embassy there was a small measure of rejoicing at the news that the jailed opposition leader, Yulia Tymoshenko, had recently been released from custody in Kharkiv. The Euromaidan is the name given to a wave of demonstrations and protests in Ukraine which began on the night of 21 November 2013, when a large number of public protests demanded closer integration with Europe. The protests evolved into deadly riots that claimed more than 100 lives and led to the removal of President Yanukovych and his government. 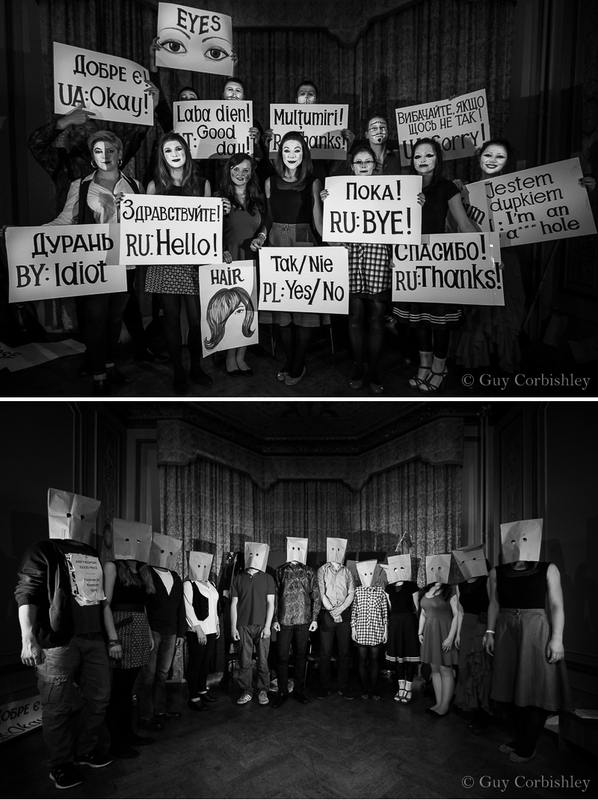 Performers of Molodyi Teatr (Young Theatre) perform the play ‘Bloody East Europeans’ at the Ukrainian Institute in London, satirising the eastern European migrant experience in the UK. The play was written by Uilleam Blacker and directed by Olesya Khromeychuk. On 24 February 2014 a few hundred British-based Poles rallied opposite Downing Street in London to protest against the on-going discrimination of Polish people living in the UK. The protest highlighted the recent attack on a Polish biker in London who had been assaulted for displaying the Polish flag on his helmet. The protesters also raised other issues raised such as populist politicians, David Cameron among them, who used Polish and other eastern European migrants as scapegoats for a faltering economy.